Netflix is teaming up with Marvel Studios founder Avi Arad to create a new King Kong CGI-animated series for the streaming service. And because “giant gorilla who constantly gets into fights with other giant monsters” isn’t a snappy enough premise for today’s kids—what with the tablets and the Minecrafts and the Vines constantly vying for their attention—Kong: King Of The Apes will also apparently be a futuristic riff on The Fugitive or The Incredible Hulk, with the heroic ape pursued by the authorities of 2050 after being framed for a crime he didn’t commit. The new series, which will begin with a feature-length movie before continuing with an initial run of 12 half-hour episodes, will be the third animated show to feature the titular primate. (It’s preceded by the Rankin-and-Bass-produced The King Kong Show from the ’60s, and 2000’s short-lived Kong: The Animated Series.) 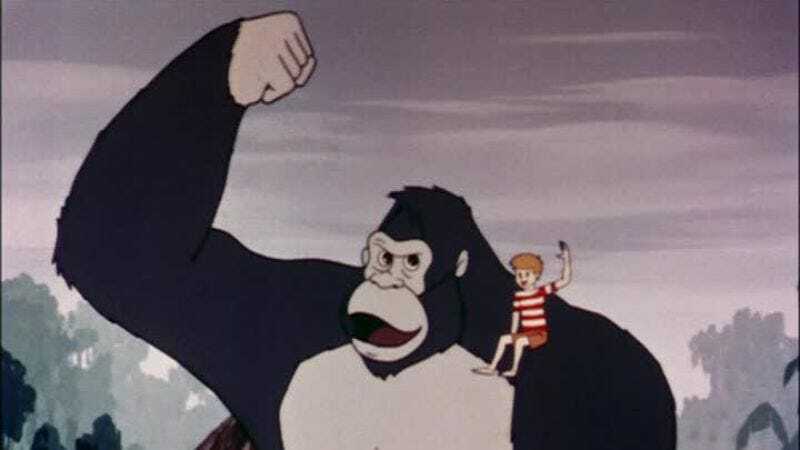 And while the new show is off to a good, kid-pandering start by including three teen sidekicks to tag along with its hirsute hero, we can only hope that producers will take a page from the ’70s Godzilla cartoon and also gift Kong with an adorably stupid baby ape sidekick. Of course, executive producer Arad has already proved that he knows exactly how to entice kids with the nostalgic artifacts of their grandparents’ generations: His latest success was DisneyXD’s Pac-Man And The Ghostly Adventures, which has turned into a huge hit for Netflix since it arrived on the streaming service in July.